Today, we've resumed normal operations at all impacted airport locations with the exception of Wilmington (ILM), which is expected to reopen Thursday, September 20 once power is restored. We continue monitoring the latest weather forecasts, airport conditions, road closures and other activities as a result of Hurricane Florence which has been downgraded to a tropical depression. We are resuming normal operations at all stations today, with the exception of Myrtle Beach (MYR), where we expect to resume service Monday and Wilmington (ILM) which is expected to reopen Tuesday. A travel waiver is in place for customers traveling to, from or through locations impacted by the storm, offering additional flexibility to change or cancel their travel plans, and waiving baggage and pet-in-cabin fees. Our thoughts are with all those impacted by the storm. 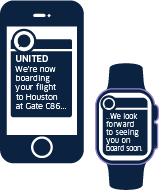 We continue to encourage customers to check their flights on united.com or the United app for the latest flight status prior to leaving for the airport. Stay tuned for more information as the storm progresses.